Winners! I’ll email you after I feed my dogs. Ashley: I would be drinking a nice hot cup of pumpkin spice while playing my resident evil 6 on xbox live with my boyfriend. Megan: Knitting! Or lighting things on fire. Kelly: Horror movie marathon! (Assuming the pumpkin spice makes it to the stores by Halloween!) It is, i’ve seen it! Julia: I would totally warm it up and drink while watching the first snowfall. Brandy: My wife and I love to make big Fall themed brunches and eat them outside with our rescue piggy, Peach and our guests. We would love to have some of this good looking sweet stuff to sip on with some pumpkin stuffed French toast! …I swear, Erin and I didn’t plan to match the round-up and giveaway. If dairy-free alternatives are taking over the world, So Delicious is leading the march. Their line is constantly expanding, and becoming available in regular grocery stores more and more. And they’re not just one-milk ponies, they offer soy, coconut, and almond products. From milks to yogurts to more ice cream and ice cream novelties than you can shake a stick at! There really is something for everyone in their product line. And unless you’ve tried all of their products, which has to be well over 100, you can’t tell me any different. So nyah. 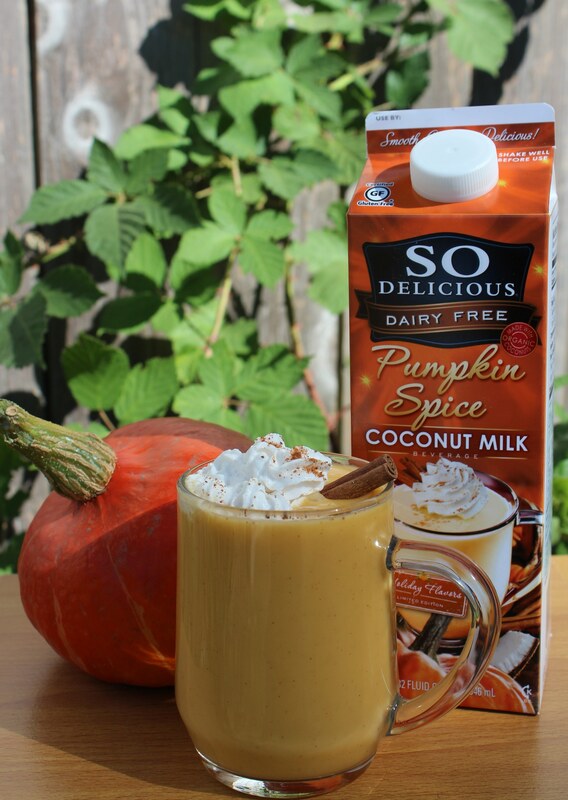 One exciting new thing that they’ve added this year is…Pumpkin Spice Coconut Milk! I’ve already seen this in my health food store so keep your eyes peeled. Also check out the recipe section of their site for some amazing vegan recipes. So Delicious has offered to send a free product coupon to five lucky winners! To enter, simply comment here, telling me what fall activity you would enjoy while sipping some Pumpkin Spice beverage (you can totally jump in leaves while holding a travel mug). This contest is US only, a winner will be drawn tomorrow at 2 pm. I would like to drink a pumpkin spice beverage while driving down pretty roads in my adopted home state of Maine. I would take mine to enjoy at the pumpkin patch while I pick out a pumpkin for carving! Taking my daughter on a hay ride at the pumpkin patch! Definitely will have this in some coffee to stay warm! I would carve pumpkins and sip some of this! oh, i’m going crazy looking at this pumkin spice cocnut milk and not having any…! Please let me have some, by the fire place, with a big blanket listening to some old fashion music. Knitting! Or lighting things on fire. Nothing like sipping that pumpkin spice while surfing the net. Yes my life is awesome. I would drink it while catching up on blogs. I would like to drink this while working on fall crafts. I would drink it hot while curled up with a blanket, a cat or three, and perhaps a fire in the seldom-used fireplace. Preferably while skipping work on a Monday. pumpkin spice coconut milk now?! that just rocketed up my list of priorities for chai makin’. I would sip while carving pumpkins by our fireplace with my family! We drink all their nogs at our annual vegan Thanksgiving dessert potluck! I would sip this while sitting in front of a blazing fire (in my nonexistent fireplace) while reading a book. Yum! I love anything with pumpkin in it. A pumpkin flavored dirty sock, you ask? Yeah, I’d probably eat that… With this yummy looking pumpkin milk I’d cozy up on the sofa and watch the “fahr” (I’m Texan) blaze in the hearth. Curled up in front of the fire with a good book! I would sit in front of a window sipping this yummy beverage looking outside at the cold weather enjoying being inside. Cookbook flipping while snuggling (with myself) in a blanket on my couch. Not during, but after an activity! After a nice cold run in the rain! Warmed up Pumpkin Spice! Radio on, stretch it out! I would enjoy watching my 6 year old cat chase leaves outside while sipping a mug of pumpkin spice coconut milk. I’d enjoy sipping it while bundled in a blanket reading MoFo posts! I’d enjoy sitting on my back stoop laughing at my crazy dog bounding along the fenceline barking at squirrels. I’d enjoy it while hanging with my sons. I’ll probably be cuddling under my snuggie sipping the delicious Pumpkin Spice drink. I would be curled up in my big chair with a good book sipping on pumpkin spice. Mmmmm, yum! I’m planning a pumpkin themed potluck to celebrate the new season, this would be a wonderful beverage to serve! I would totally warm it up and drink while watching the first snowfall. I would love to sit by the fire sipping warm drinks. And I love walking and hearing the crunch of the leaves. While watching my 8-year-old decorate the house in increasingly more elaborate Halloween style, for sure. Curled up on the sofa in my Yankees snuggie reading something other than a graduate school textbook or anything work/school-related. sitting around the fire with my mug of yumminess. Taking a weekend trip with friends to view fall foilage and pick apples at the apple orchard. Ah, I would love to drink this while knitting a scarf for the cold weather ahead! Mmm, pumpkin coconut milk… the perfect way to stay hydrated while playing with fire. Wouldn’t even pour it into a glass, just take the whole carton out with me. I want to nuke a ton of this for myself and my pals while we staff the National Lawyers Guild jail support hotline, providing free legal support to the Occupy movement activists who are demonstrating to mark the one year anniversary of Occupy camps all over the country. Occupy is autumnal! I know this will sound cheesy but I would love to just curl up and read with this pumpkin spice. It sounds so delicious and I’m in the middle of ‘Wild.’ Nothing like reading about deprivation on the road while drinking a delicious dairy free drink. I would bring a piping hot cup of this on the road to pick pumpkins! Fall activity while sipping a mug of pumpkin spice coconut milk — cuddling with my two chi doggies and my two kitties (all rescues) under a warm blanket, watching an old timey movie, most likely a Gene Kelly or Fred Astaire flick. I would drink this while bundled up in a parka overlooking the San Francisco Bay to see if I could spot some cormorants, grebes and harbor seals! I would love to carve pumpkins while sipping pumpkin spice. I would totally love to drink that while sitting in the black and red cafe next week when they will be screening “night of the living dead”. Oh yes! I think I could do just about anything with a cup of Pumpkin Spice Coconut Milk, but you’d most likely find me updating my blog! I’m so excited about the return of all of the holiday flavors—its always so sad when the stores stop carrying them for the season. Enjoying a warmed cup of So Delicious Pumpkin Spice Coconut Milk while relaxing on our patio over looking the Hudson River. Wrapped up in a blanket enjoying the sights, sounds and favors of fall. I would drink it while flipping through cook books! I would drink it in Central Park while walking around and taking pictures with my dog, Barker. Sitting on my back deck and watching the leaves fall, So Delicious in a warm mug in hand. I’d sip while reading blogs & cookbooks, planning my holiday menus. Afterwards I’d be relaxing watching football! My wife and I love to make big Fall themed brunches and eat them outside with our rescue piggy, Peach and our guests. We would love to have some of this good looking sweet stuff to sip on with some pumpkin stuffed French toast! i would probably sip on this while baking something sweet and pumpkin-y. mmmm. I want to drink it while carving pumpkins and having pumpkin goo and seeds stuck all over my hands and fingers. I would enjoy sipping some Pumpkin Spice from the hammock, while throwing the tennis ball into giant piles of leaves for my two big goofy dogs! This sounds like just the thing I’d want to drink the morning after Thanksgiving while waiting for my mom to get ready for our trip from TX to TN. If I were back home in Michigan, I would drink it while on a hay ride to the pumpkin patch. In California, however, I would drink it to warm up from taking pictures in the “snow” (created for the filming of a movie nearby). Anytime is a good time for pumpkin spice! Making pumpkin muffins, pumpkin cheesecake, pumpkin soup and anything & everything else pumpkin I can think of! My most favorite flavor by far! I would enjoy it while on a scenic drive on a sunny fall day! Carving pumpkins with my kids. For one of them, this will be her first year! I would bring some to Thanksgiving With The Turkeys at my local animal sanctuary. Turkeys love coconut milk. I’d be sitting nice and comfy in the living room watching TV. Leaf Peeping! And/or apple picking! wow – so excited about this flavor – haven’t had a pumpkin beverage since going vegan 2 years ago. I would drink this while skyping with my 2 year old who lives in Nebraska. I live in Ohio. I would curl up by the fireplace and sip my drink while reading! Yum! Perfect for sipping while pumpkin carving and roasting seeds! Yummy! I would enjoy a frosty glass after cooking up a storm, relaxing with my pup. i would drink this while preparing for my annual halloween party! cooking, baking, cleaning, everything! I would drink it while catching up on the latest vegan mofo posts! After a long day of work among omnivores……curl up on a cold evening and have a wonderful ,easy to fix, vegan treat!!!!!!!!! Sounds heavenly!!! I would drink it on my birthday morning in November! I woud share it with the neighborhood as we all carved pumpkins in the park. Last season my mother had her fireplace repaired in the old house she lives in (it was broken since she was a very little girl). Now the family gets together in front of the fire listening to music and drinking warm drinks. It’s just so much fun. I am sure that a mug of Pumpkin Spice Coconut Milk would fit the bill easily. Reading a good book, or knitting, with a warm pumpkiny beverage! I can’t wait to try this. I would drink this on the couch, either knitting or reading, with a cat curled up next to me! I would hold my travel mug of spicy pumpkin coconut milk while ice scating. We always make sure to carve pumpkins every years 🙂 And make as much pumpkin flavored desserts as possible! This pumpkin drink looks amazing! I’m a blankets and TV kind of sipper. Mmmm…pumpkin spice. I could drink an entire container of that in one sitting. I don’t. Well, not as far as you know. I would warm some up, throw it in a travel mug and walk my pooch through some wet leaves in the Pacific Northwest. As much as I dislike corporatism there is a mall near where I live that has beautiful holiday decorations. I love walking around the mall while the play holiday music and sip seasonal beverages. I would enjoy crocheting all the Hanukkah gifts I am in the process of making….. Even more if sipping some so deliciousness!!!! Can’t think of anything better than sippin’ on some pumpkin while cozying up on the couch, reading a book and listening to some classical musics. I’d love to sip some pumpkin spice beverage while taking a hayride at the pumpkin patch!!! I would be drinking a nice hot cup of pumpkin spice while playing my resident evil 6 on xbox live with my boyfriend. I would plant my fall bulbs (tulips and daffodils), an activity I keep postponing, while sipping this delicious vegan treat in between! I would abstain from all other activities while drinking this beverage so as to channel all of my energy towards experiencing its otherworldly flavor. Seriously. All of my family would be gone so I could drink this deliciousness in peace whilst knitting. I want to drink that pumpkin spice goodness while adventuring through a corn maze!!!! Watch trashy guilty-pleasure TV – totally comforting. I would bring it to the beach in a thermos at sunset with my sweetheart. I would love to cuddle up with a good book and a cup of pumpkin drink! I have not seen it in stores but would love to try it. I love So Delicious’s coconut Ice Cream. Watching college football on Saturdays and NFL football on Sundays while munching vegan snacks, and sipping Pumpkin Spice Coconut Milk, and waiting for So Delicious’ seasonal Coconut Nog to return to my grocer’s shelves.